How amazing is this? 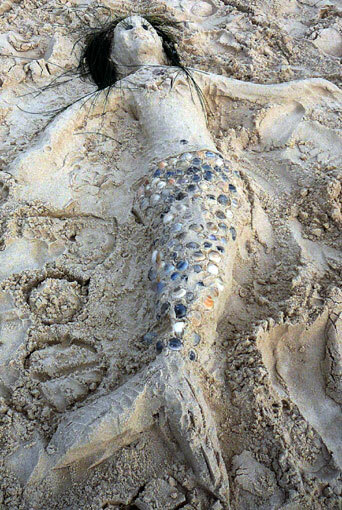 A mermaid found on the beach at Burleigh, Queensland. Artist/s unknown but this work needs to be honoured and shared. What a thrill and delight to find her. Just look at her tail. Such time and care to place the shells. She even has eyelashes, a navel and long mermaid tresses. Does she perhaps hum a song of the sea as the waves rise and fall lapping in closer to embrace her and take her home. What is it she contemplates so deeply? And what an inspiration! Wondering if she is a coincidence or a reminder. My first ever needlefelt sculpt was a mermaid. Presently working on more earthy elementals for a winter themed swap. Although relishing the challenge finding that it has been a little more difficult that anticipated because of the pressure I put on myself. Perhaps this lovely creature is saying “let go and just let it flow”.